Part two of MoJo‘s greener gift guide: Step away from the mall. Here are two easy DIY projects you can do with stuff you might even already have on hand. I spent a nice few hours on Saturday making custom cards, chatting with my roommates, and listening to music all the while. Cheaper than shopping, and much more pleasant. Wrapping paper, wall paper, old magazines—anything with images you’d like to cut out (I used some old ads for ladies hats that I found at a vintage store). Simply cut out images you like and glue them to the cards. 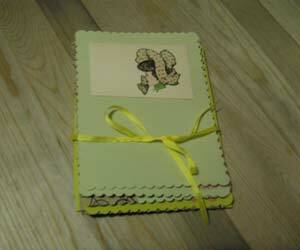 You can package the cards and envelopes together in groups of three to five, and tie each bundle with a ribbon. 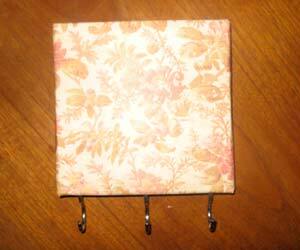 Wrap the picture frame like a present, creating a smooth surface over the front where the picture would go. Staple or glue the edges to the back. Screw key hooks into the bottom of the frame. Hang like you would a picture.